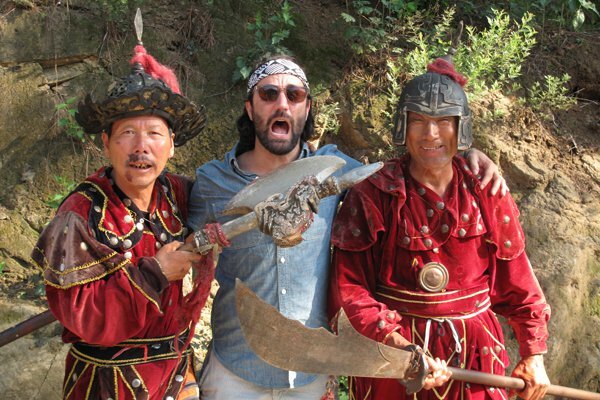 Casey making new friends in China. Casey Storm is a costume designer whose job takes him to far-off lands on film and commericial projects. In part due to his impressive collection of ashtrays nicked from the Alvear Palace, he is known for bringing home the best souvenirs. Reading Material: Throwaway mystery novels by Dean Koontz. That guy is prolific. Travel Snack: Corn nuts. They always taste better on a plane. App: Words with Friends. I have about fourteen games going. It makes waiting-around time fly. Instant Upgrade: I can be on location for months, so sometimes I bring my Tempurpedic pillow. I don't care if it makes me look like one of those teenage girls in pink sweatpants at the airport. Casey is a costume designer living in Los Angeles, where he was born and raised. He travels usually for the job and always for the experience.